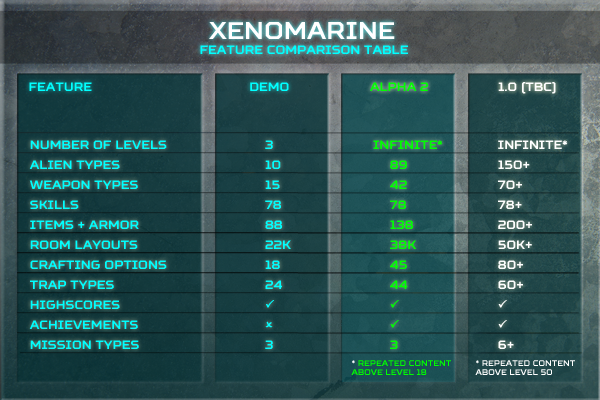 The second Alpha version of Xenomarine is now available to download below. Alpha 2 finally removes the level cap of previous releases, meaning there are now infinitely many levels containing increasingly deadly aliens. Other new features in Alpha 2 inlude randomly generated miniquests, 27 unlockable achievements, and 21 new item/armor/weapon types. How do i get Alpha 2 when Alpha 1 is already installed ? There is no auto-update it seems, as the game miniature says "Alpha 1". As i did a preview of pre-Alpha 1, played some Alpha 1 and was waiting for Alpha 2 to update my article with a more consistent game. Sorry, I had just forgotten to update the itch miniature to read Alpha 2, which I have now done. NB the version number is shown on the splash screen so you can check you have the right version after launching. But let me know if you have any problems. FYI, I aim to release the Steam version in the next few weeks - release schedule partly depends on whether I decide to add permaprogression, as I guess a good chunk of the Steam audience may agree with you about that! Thanks, there may be an issue with itchio's links somewhere, then. When i install and launch from itchio client, i get the demo 2.4 Linux. When i follow the link you've sent to my email, i can download Alpha2 Linux. Any news on this ? My local folder only has linux demo, and an osx folder with Linux demo on it too. From itchio client, or if i go to my itchio page on Firefox, i cannot DL the alpha, only the demo. But, if i use the link provided in our email, i can then DL the Alpha. Hello, still the same issue with Alpha 3. I can DL the client and then play from my folder if i use thi link from your email, but from itchio, it only DL the demo, and fails to launch anyway. Thanks, sounds like it might be a problem with the itch client, I'll get in touch with them to see if they are aware of the problem. Sounds like you have a working version of Alpha 3 now though? Yes, i can get alpha 3 if i follow the link straight from your email, but from itch website or client, i only can reach the demo. Weird because the link is linked to my itch account anyway.